I will say from the beginning - I did not enjoy this walk. We turned up at the large woodland area called Athalassa Park, a short distance from Nicosia, and the first thing I saw were signs on every tree and gate saying 'No Dogs Allowed'. It did look like the main part of the park was fairly lovely. We were there on a Sunday and it was full of cyclists, families out picnicking, couples out having romantic walks. But, no dogs. And very explicitly so. They had designated a small area of the park to be dog-friendly, and this was clearly marked on the maps displayed in the park. So off we went. 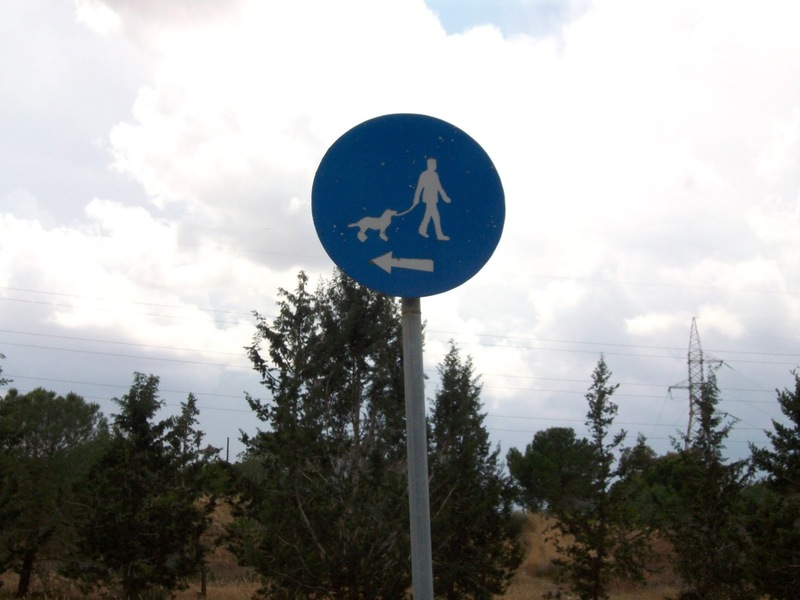 Actually, this is the only designated dog-friendly area I have seen in Cyprus, (I am sure there are others, but so far this is all I have seen). Despite being an area for dogs, however, there was not a single bin provided along the route. We had to temporarily stash our bag of poo in a conspicuous place so as not to carry it all round the park. Another negative for me was that, in contrast to the Anti-Dog section of the park that looked densely wooded and green, this section was barren and burnt and brown. I'm sure Sage didn't really mind, but had it been a hotter day we would really have suffered. To make matters worse, we got quite lost at some point. It seemed like the Dogs Permitted path just kind of tapered out, and we found ourselves among fields with a distinctly military feel. 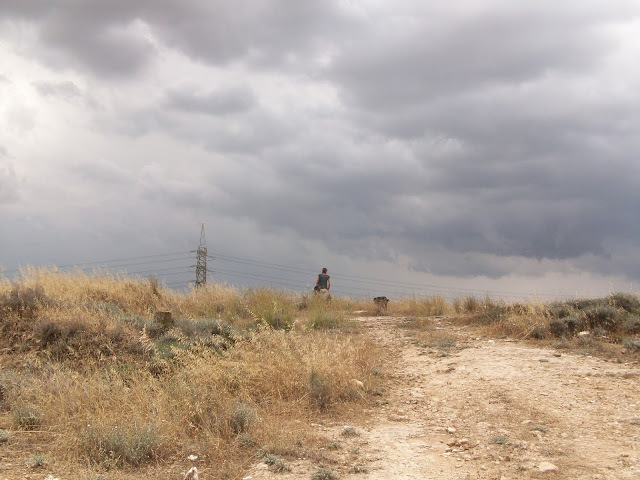 At some point the path we were on ended in a field, and we were considering crossing the field when we saw a notice nailed the gate warning of land mines!!! And then it started to rain. This is a kind of rain that is more typical of the tropics than Europe, although it does rain like this in Greece too. It's the kind of rain that begins out of nowhere. It doesn't drizzle a bit and pick up force, it's as if someone suddenly starts emptying entire buckets of water on you, and doesn't stop this flow for at least half an hour. The path we were on turned into a muddy river that literally starting coming over the top of my shoes. My skirt was wrapped around my legs, glued there with mud and rain. I'd optimistically put on sun cream in the morning, which ran into my eyes rendering me blind. And we were still lost. We started heading in what felt like the right direction, cutting across paths and small patches of woodland, but couldn't see the sign posts anywhere. We couldn't really see anything at this point. Sage seemed like she was having a good time though - she always liked rain. Then the storm really caught hold, with thunder rumbling continuously all around us, sounding dangerously close, and intense bright flashes of lightning. Reaching a point that was clearly wrong, where we could either continue our present path up to a military base at the top of a steep hill, or cut across a corn field, we decided to go cross country. I could see Sage bounding ahead, circling round, leaping up and down through the corn - having a wonderful time. Myself, I was trying to decide which was the biggest threat to our safety - snakes, lightning, or land mines? Anyway, we made it out of the field and somehow got back to the car park, and our adventures ended there. We never did go back and collect the bag of dog poo though. So if you are looking for a place to go with your dog for walks, jogging, or even cycling, in the Nicosia area, you could try the dog-friendly section of the Athalassa Park. I hope you enjoy it more than I did.